Internal, Submersible UV Sterilizer Filter, Pump; Review (for Aquarium or Pond) . Part 2; These UV Filters Should be Avoided! This article/post is a partner to another article where one section discussed issues with submersible UV Filters, pump. This article will expand on this type of UV Sterilizer explaining both positives and negatives and proper use. The first generation Internal UV Filter/Pumps created a lot of excitement, at least among many aquarium maintenance professionals I knew/know. However as these were purchased and then utilized in aquariums or ponds, their short comings became apparent. In particular the problem of leakage causing electrical shorts and often destroying the UV. 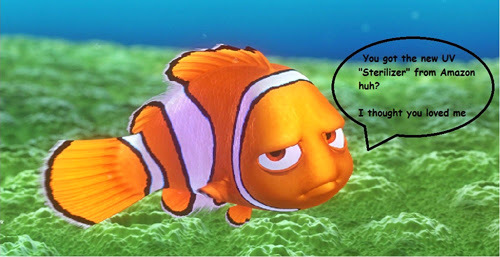 This problem was even more prevalent with the Green Killing Machine and their rather bizarre and VERY rude, condescending, & un-professional phone call to an aquarium professional friend about his reply to a comment THEY posted on HIS YouTube UV Sterilizer video tells me this is NOT a company I could recommend -EVER. The Submariner and other similar versions sold on Amazon.com and elsewhere are a slight improvement, however this UV clarifier is still not all that well designed in both water flow rate & pattern, as well as lack of proper pre-filtration for water turbidity and the use of low quality medium pressure UV Bulbs resulting ONLY in clarification abilities, not level 1 sterilization. As too with the Killing Machine which it too cannot perform level one sterilization, only clarification (& even then clarification is not as efficiently achieved as would be with a level one or two capable TRUE UV Sterilizer). As well, the sealing of the UV Bulb & Quartz Sleeve is still an issue, resulting in short lives of 6-18 months for many of these units. Although still inferior to out of the water, high dwell time UV Sterilizers (such as the highest dwell time of ANY UV; TMC Vecton or Advantage or even compact UVs with reasonable dwell time, such as the Terminator); the Unique AAP/SunSun Internal UV CUP series with pre-filter, flow adjustment, and low pressure UV Bulb appears to have finally gotten this great idea reasonably correct! The plus side to these submersible UV Pump/Filters is the need for no additional plumbing in aquariums or ponds, not that splicing a line for a TMC or Terminator UV is all that difficult (with ponds though, extra devices such as UVs can sometimes be a bit more of a plumbing project). However the another entry into the field of Internal UVs are still incorrect as per their flow rate (& construction); The AquaTop UV Sterilizer Pump 3, 5, 7, & 9 watt are actually no better than the Submariner or similar early generation Internal UVs (please read more about these later in the article). First the Proprietary Heavy duty 13 watt and 9 watt UV Pump/Filter design with double O Rings seems to have solved the leakage/UVC short problem for the most part, and the flow pattern/design is also improved over earlier Submariner and similar models. One negative is "rated" flow rate, however as per our tests this "rated" flow rate is not the actual flow rate; the actual/adjusted flow for certain proprietary units by AAP is much better for level one UV Sterilization. The propeller design of the impeller has little head pressure which actually is better for maintaining a flow rate of 25 gph per watt in the vertical configuration. However, the flow rate is not good enough for circulation of very large aquariums or ponds, so for this reason other circulation pumps should be utilized so and I advice to not depend upon these UV Pumps as the primary mode of circulation. The AAP 13 Watt CUP-613 Pump/Filter Model performed well in initial tests, however the AAP 9 Watt UV CUP-609 Pump/Filter Model uses the same 528 gallons per hour manufacturer rated water pump as the 13 watt model which is generally too high for level 1 UV Sterilization. HOWEVER later tests following adjustments made by AAP of this UV Sterilizer in configuration showed only a 160 gph flow rate in an aquarium in the vertical configuration which is appropriate for level 1 sterilization (9 times 25 = 225 gph or less). Please note that these "correct flow rate" models are NOT sold on eBay, Amazon, etc., only by professional sellers such as AAP. 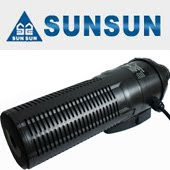 BE AWARE, that SunSun is a company that makes probably more models of aquarium & pond equipment to various specifications, probably more so than any such aquarium/pond supply manufacturer in the world. NOT ALL PRODUCTS ARE THE SAME, EVEN WITH THE SAME MODEL NUMBER!!! Also since many persons in the USA & Canada have the perception that all Chinese made products are junk, let me correct this somewhat. As an example, when a retailer or distributor approaches a typical North American or European manufacturer for a certain product and offers a certain price point that is below what the manufacturer offers the product for, if the manufacturer agrees to the terms, they will get the same product off their production line for this lower price. HOWEVER with these Chinese manufacturers, INCLUDING SunSun, if someone such as Amazon.com sellers offer a lower price point, SunSun (& others in China) will agree, BUT BUILD IT TO THIS PRICE POINT. ALL products are built to order, not sold out of inventory for the price paid!! This means that these companies, especially Amazon.com are successful because they sell products are low prices, that also cost them less too (better profits). Many are are sold with lower cost, but lower output medium pressure UV bulbs (basically "nail curing" UV bulbs commonly sold on eBay, Amazon, etc as low cost alternative to true level one capable low pressure UVC lamps/bulbs). 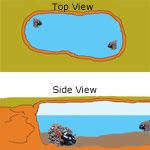 If used in a pond, I STRONGLY suggest "nesting" your SunSun Internal UV Pump/Filter under .5" to 1.5" rock (volcanic rock works best) so as to act as a pre-filter and block larger debris from entering your UV Filter. If not done, I can almost guarantee you will not be happy with your Pond UV Clarifier! One of the positives of these new generation SunSun CUP Submersible UV Pump/Filters is the simplicity of installation, which in a pond that is already set-up, is a major plus. Since the SunSun CUP-13 can work in a pond up to 1500 gallons (assuming otherwise reasonably good filtration), a pond owner with say a 2500 gallon pond can utilize two of these UV Pumps to help maintain a clear pond where the fish can actually be seen. For yet larger ponds, multiples of this innovative UV Sterilizer pump can be utilized. While speaking about pond UV use, it is always still best to use an "in-line" UV Sterilizer, and if you are seeking the best of the best, especially for large ponds (or aquariums systems), NOTHING beats the AAP/TMC line of UV Sterilizers. The two premier UVs in this line for Ponds are the PRO Pond 30 and 110 watt. While the SunSun and related exact same models sold under different brand names have improved in this area over the Submariner, PH-8/UV-3 3 watt and more; these are still below the level of sterilization when compared to either quality compact UVs or especially the Premium High Dwell Time UVs (such as the before mentioned Vecton & Advantage). As well the SunSun and exact same models sold under different brand names have improved on the design that prevents electrical shorts, HOWEVER from feedback from my network of aquarium professionals, these still are not as durable as MOST out of water UV Sterilizers. This said, these are still of a better design as per durability than the earlier generation submersible Internal UV Pump/Filters as well as the plethora in-line submersible UVs such as the basic model Aqua Top, Submariner, and others. My suggestions/recommendation for the 13 Watt or 9 Watt UV Pump/Filter is this is an reasonably well designed device for water clarification or basic level 1 Sterilization for small ponds or small to medium aquariums, especially for those desiring a simple UV application without the availability of a canister filter or similar to power a standard UV Sterilizer. HOWEVER for those needing top notch level 1 sterilization and most certainly level 2 sterilization, this new device is not for you (especially in demanding environments or larger ponds/aquariums). For these applications consider the excellent but economical Terminator UV Sterilizer or for top notch professional applications, the AAP/TMC Advantage or Vecton UV Sterilizers. Also consider where you purchase your new Internal UV Sterilizer Pump (as noted earlier these are sold under many brand names, but made in the same factory), as most retailers selling these have no knowledge of UV Sterilization and will tell you what you want to hear/read and also supply no customer service or product knowledge of use.. These UV Filters Below Should be Avoided! Unfortunately the vast majority of Inline, Internal, etc UV Sterilizers such as the "Killing Machine" are not sterilizers at all, only clarifiers. This is basically a Green Killing Machine. As with the Green Killing Machine, this is excellent for green water clarification. However a short life and expensive upkeep including the replacement UV Bulb since the entire bulb & ballast must be replaced (this IMO is to deal with the leakage issues that otherwise damage the ballast). As it turns out, this so-called "deal" for these UV Clarifiers is not so much of a deal when you go to replace the lamp/ballast @ $26.99 for the 9W or $39.99 for the 24W, not to mention these are NOT capable of true UV Sterilization which SHOULD BE the reason for purchase of such a product as often a cloudy or green aquarium is an indicator of poor maintenance such as too-high bio load, over feeding, poor filtration, etc. In the end, as with most submersible/in-tank UVs, these are ONLY a clarifier and not capable of level one UV Sterilization or higher. So combine this with expensive upkeep and only clarification abilities, this UV in the end is not the deal it may seem to be. As another example, SunSun Basic, JUP-01, JUP-23 13W and the AquaTop PH-8/UV-3, 5, 7, & 9 watt Inline UV Sterilizers are not of the more robust filter and UV flow design as the larger SunSun CUP-613 & CUP-609, rather these are simply knock offs of the "cheesie" internal UV flow and over all design of the earlier Internal UV pumps (& sadly still sold by Amazon and many others). Also many of these internal/submersible UVs sold at Amazon and elsewhere do not come with a pre-filter sponge and thus the water turbidity inside the UV sterilization chamber is too high for the UVC to truly be effective. The low prices of these as well as the Submariner, etc. reflect their ability to only clarify, not sterilizer. As an example, the cheesie UV-3 watt marketed for undergravel filters runs at 158 gph with a 3 watt UV bulb; HOWEVER as per correct Level One UV Sterilization, this would require a flow of UNDER 75 gph to be effective!! (Dwell time is another considerations where these designs fall well shot of anything other than clarification). 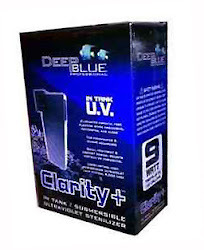 Another newer entry with great marketing is the Deep Blue Clarity+ Submersible UVs. These advertise "Long-lasting, high performance ultraviolet lamp (typical 9,000 hrs)", however a HO low pressure UV lamp has a useful life of about half this, so this is suspect as to the output. Typically the long life medium pressure UV lamps have 1/4 the UVC output. As well the claim is "optimized circulation pump included" yet the flow is not advertised, as the dwell time is quite questionable. These also do not have true "pre-filtration" which is important for any UV function as noted earlier in this article. In the end, this too is primarily just a UV Clarifier, which is fine if that is all you are purchasing this product for, not level one sterilization. If Clarification is all you need, not true level one sterilization or greater for Redox balance, disease control, and fish immunity issues, these above noted filters might be a good choice since these are well under $50 (with the exception of the Deep Blue), but again if you do your research and need true UV Sterilization, you will need to go with a true UV Sterilizer such as the good AAP Terminators or the top notch premium AAP/TMC Vecton/Advantage UV Sterilizers, Aqua Ultraviolet, or Emperor UV. These along with the earlier previously mentioned JBJ Submariner, Killing Machines, etc. UV Pumps SHOULD BE AVOIDED! As final note, as with any UV Sterilizer, changing the UV Bulb every six months is important for optimum operation (a must for level 1 sterilization). Thanks for posting, this is really what we all need to know and i am glad to check out this information, i will be keep blogging in future. UV Sterilizer is normally used to control bacteria, yeast, mold and other pathogens effectively control the growth of algae in turn. I like this blog very much. Nice source of information. Very useful information, but I need to ask, I have a fish tank not so big. Just 40gal but I had 2 fishes dying from Mycrobacteriosis and I read at Diana Walstad saying that a 8watt UV gave her amazing results. The Sunsun CUP-613 seems a lil too big for my fish tank, can I still use some model like the JUP-23? both are Sunsun. Please help. You need level one Sterilization, which this is one of the few internal UVs that can perform this, however a Vecton 8 Watt run on a separate pump/filter will do a better job. The other small internal/submersible UVs will not do the job. I have a 75 Gallon Freshwater tank, and I do not have canister filters. So my only option would be a hang on back sterilizer. What is the best one you can recommend for me that would keep the parasite level down? and how this can be used. 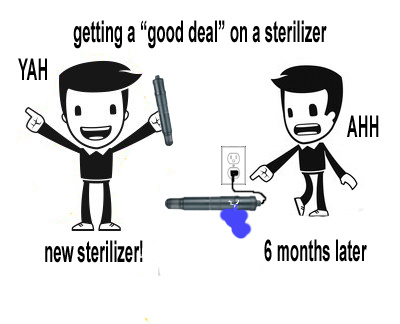 Buy only quality of Sterilizer. We had an algae bloom in a 55 gallon aquarium that housed several large fancy goldfish. Goldfish are quite sensitive to most chemicals, so I couldn't use any sort of chemical additive to kill off the algae. Keeping the tank dark and doing several massive water changes MIGHT have gotten rid of the algae, but would have been difficult for me and risky for the fish. I decided to try a UV sterilizer. Professional tests and reviews suggested that the SUNSUN 13W UV Sterilizer and the Green Killing Machine were probably the two best values for what I needed. Both are similar devices that work the same way. Both have a large number of good reviews, and both have a number of reviews pointing out various problems that can occur. And, of course, both products are made in China, where quality control can be somewhat suspect. A little shopping found the best price on either product, from a seller in the US, was the SUNSUN 13W UV Sterilizer from a seller on eBay. When I received my sterilizer, I inspected it thoroughly before using it. As expected, the instructions that came with it were nearly useless, but it wasn't too hard to disassemble it. I checked each of the likely problem areas and found no problems. As was indicated in several of the reviews, I did remove the plastic piece that the manufacturer uses to hold the UV bulb in shipping (not mentioned anywhere I found in the directions that come with this). I assembled the sterilizer, installed it in the tank, and turned it on. The pump in this unit moves an amazing amount of water - easily two to four times the flow rate of any common on-tank filter. The water inlet is fairly large, but the outlet is about 1/2 cm2, resulting in a very powerful stream of water. I was a bit concerned that this might be a problem for the fish. The outlet is near the top of the sterilizer which puts it just below the surface of the water. This makes the strength of the water flow even more obvious as you will have waves across the top of the tank! 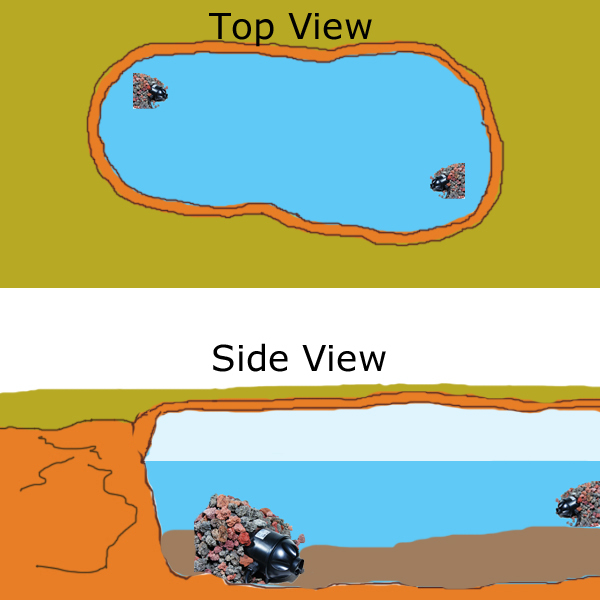 Fortunately the fast water current only effects about the top two inches of the water so most of the tank water is not moving nearly as quickly. The current across the top was enough to push any of the fish clear across the four foot length of the tank, but rather than being a problem, I found that apparently the fish liked it! The fish mostly stayed in the middle and bottom of the tank where there was no strong current, but I noticed that occasionally some of the fish would deliberately swim up to the corner where the sterilizer was installed, then come up to the top and ride the current all the way to the other end of the tank. After 2-3 days it was obvious that the sterilizer was killing off the algae and by the end of the week the water was crystal clear. Keep in mind that the sterilizer kills the algae but doesn't actually remove it, so you still need your regular filtration to remove the algae as the sterilizer kills it. The reasons I gave this 4 stars instead of 5 are because of the poor instructions and because of the small outlet area which could easily be improved by adding some sort of spreader. This unit is rated for up to a 150 gallon tank but not for a minimum size. Having used it in a 55 gallon tank, I would not consider this unit in anything smaller than a 30 gallon tank and I'd have to think twice about even a 30 - the unit should work OK in a 45 gallon or larger tank with a length of 4 foot or more. To use it in a smaller tank you would absolutely need to find a way to spread out the flow. While it is good that you got this to work, I should point out that NO, the Green Killing Machine is NOT a good value. Ballast failures are high, and while it can control algae, since it is a clarifier at best, it is not as effective as a true UV Sterilizer. As for the SunSun 13 watt UVs sold on eBay, while I do not know what model was sold, I do know that just to pay the 10% costs of selling on eBay, these cannot be sold profitably with either the pre-filter or HO low pressure UV lamp (or both). The result is a much less effective UV Clarifier & certainly NOT a true UV Sterilizer. Finally, what is probably most important, purchases on eBay & Amazon are destroying the quality of the hobby as those selling quality products and providing quality information are dropping like flies, leaving mostly those who provide crap information and crap products. By purchases such equipment, I am sorry to say you are contributing to the demise of the industry/hobby. Thanks for sharing this blog. glass bead sterilizers used to kill living components from the research samples by the sterilization process.